KRT15 expression levels define a gradient of stem cell characteristics in isolated scalp keratinocytes. (A) Using flow cytometry analysis, basal layer (ITGA6+) cells at the indicated percentiles of KRT15 staining intensity were plotted against their cell size. Increasing levels of KRT15 correlated with smaller cell size (n = 5, P = 0.002 to P = 1.58 × 10–5). 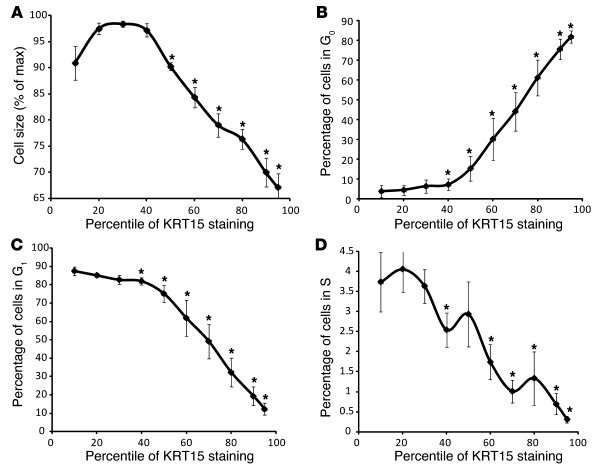 (B–D) Cell cycle analyses of cells expressing different levels of KRT15. Increasing levels of KRT15 correlated with quiescence. Cells at the 95th percentile for KRT15 expression were predominantly in G0 (B; n = 5, P = 3.85 × 10–5), whereas cells at the 10th percentile were predominantly in G1 (C; n = 5, P = 3.1 × 10–5) and S (D; n = 5, P = 0.0003). *P < 0.05.